If your person or organization could have a toolbox with 3 things that would help them make a difference, what would they be? 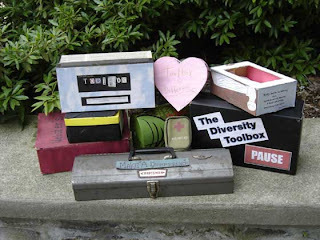 In a creative way, include 3 tangible objects that symbolize how to make a difference and put them in a “toolbox”. This toolbox doesn’t necessarily have to be a regular toolbox. It can be a creative enclosure that relates to your topic. Include 3 brief descriptions of the items and how your person or organization would use them to make a difference. This toolbox will be included on your table for the final presentation. If you click the picture above, you will see examples of similar toolboxes that were created for a topic in genocide prevention. You can also visit the Be the Change website to see what the featured people would include in their toolbox.